In the early 90s there was no shortage of guitar-laden alternative rock. Any guy could pick up an instrument and attempt to get famous, but then again that's just how the industry was. Because of this, there were artists that were over looked and not given the opportunity they deserved. 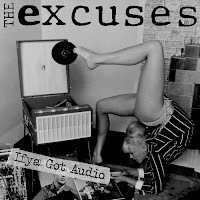 One such band was Nashville based trio, the excuses. They were set up to do big things. They had signed a record contract, were promised a concert tour opening for The Cranberries and were going to do it all until shoddy management derailed their fledgling efforts. It didn't stop them from recording their 13 track debut album in 1994, Messin With My Good Life. So what happens when life does what it does and three friends that had a tremendous amount of promise come back almost 20 years later to record a followup? 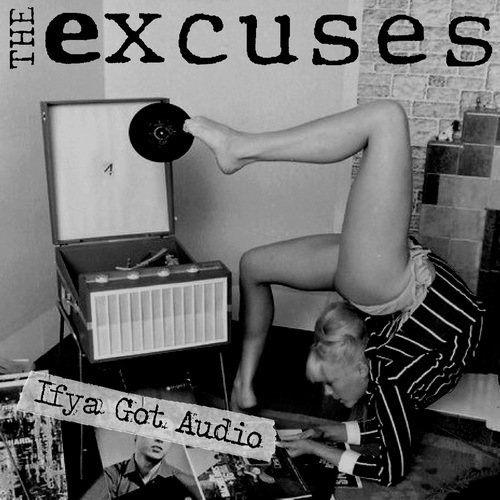 The answer is, Ifya got audio, a super cool album that channels The Replacements, a little Social Distortion and even the Gin Blossoms. Jeff Skorik has such a cool voice that has this gravel-ly edge to it that sounds like it's been crafted by Marlboros and cheap whiskey. Bass player Pat Meusel does an incredible job with back up vocals and laying a beat down that gives the tracks such a huge sound but the band isn't complete without Chris Minnis on drums paving the way with his blistering percussion. If they were to tour today, I would want to see them with The Gaslight Anthem because I think their honest brand of rock and roll is what today's music industry is missing. This album was a labor of love for the guys because they aren't doing it to be famous anymore. They are doing it because they can. I think that's probably one of the most amazing reasons to create art. You have the ability and you have the want. So many groups are doing it for the wrong reasons and because of that we end up with so many cookie cut artists that you can't tell apart. If you listen to this album and compare it to their first release, you can hear how life has changed the guys. Their experiences, their successes and failures have shaped them into the men/musicians they are today and without that time, this album wouldn't be what it is. The maturity in their writing and their musicality is prevalent throughout the album and that gives it a "weathered" feeling like when bronze begins to patina. It only makes it more unique and individual with time and I think that's what has happened to the excuses. So how is the album you ask. It's great. I've actually had it in rotation with my other stuff lately. Everyone knows that Pop music is my bread and butter but when you take this style of down-to-earth alternative music that is reminiscent of some of my most favorite groups of all time, there is no way that I am not just going to be all about it. I picked, "in a letter" to be the show piece of this album because I think that its a really cool song where all three guys come together well. A lot of albums have highs and lows but I really don't think there are too many (if any at all) on this album. Each song takes you to a different place and I think that is a hallmark of a fantastic album. I will say that my absolute favorite tracks are "in a letter", "had enough", "oh girl", and "freak". But as I said, there aren't any bad tracks. It's $10 on bandcamp and remember all the money they make from selling the album goes directly to the artists. So give them your money. Buy both albums, buy their t-shirts because they are totally deserving of your support. Have I steered you wrong in the least at this point in time? 2. has anybody ever loved you like this? This is spiky in a way that makes you wanna throw yourself on the spikes! Takes me back to my wild younger years, when I woulda sung along as if I knew all the words (which I probably wouldn't have) and gone home high as kite off the smell of booze I as likely slipped on as drank. If "abandon" had a sound, I think this might be it.